Get ready for some intense action in this 4-DVD set featuring America's classic racers. 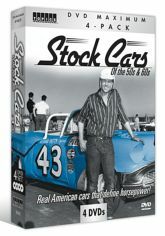 Watch out for the biggest pileup in auto racing history in Stock Cars Grow Up: NASCAR 1959-1962. Hang on for some wild racing footage in Stock Car Memories: Darlington-Southern 500 - 1955, 1956. Witness Daytona's transition from beach track to speedway in Stock Car Memories: Daytona 500 - 1958, 1959. Then, you won't believe your eyes when you see an Impala drag race a Cessna airplane in Chevy Comparisons!